Sri Lanka co-sponsored Resolution 30/1 in 2015 and committed to a range of measures on human rights, accountability and reconciliation. Sri Lanka’s progress in fulfilling its commitments will be discussed on March 20, 2019, at the 40th session of the UNHRC. 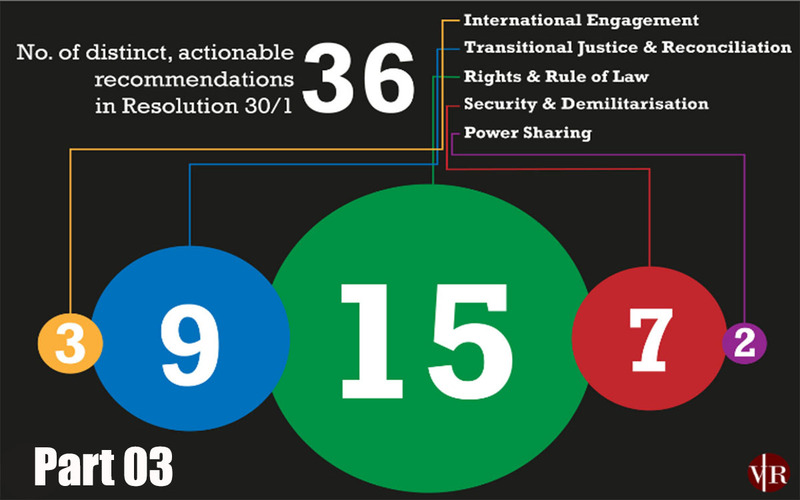 Since 2016, Verité Research has annually assessed government progress in fulfilling all 36 actionable commitments in Resolution 30/1. According to Verité’s latest assessment, the government has fulfilled 6 out of 36 commitments as at March 2019. This is the third article in a four-part series outlining government progress in fulfilling these commitments. It focuses on commitments related to security and demilitarisation. The government made seven commitments on security and demilitarisation. 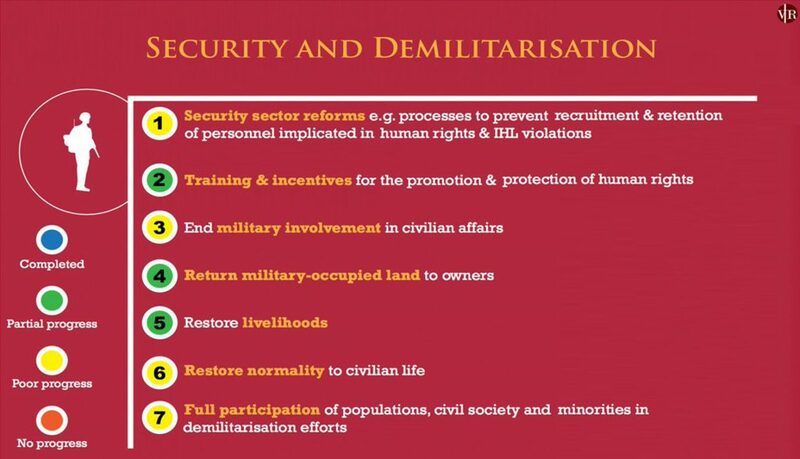 These include returning military occupied land to owners, ending military involvement in civilian affairs, and introducing reforms within the security sector. As at March 2019, no commitment had been fully implemented (figure 1). The government made progress in releasing military-held land to its rightful civilian owners, with periodic land releases over the last four years. In October 2018, the President issued a directive ordering the release of all civilian land in the North and East by the end of 2018. According to the Secretariat for Coordinating Reconciliation Mechanisms (SCRM), 46,320 acres were released between 2015 and 2018 in the Northern and Eastern Provinces. Land released during this period consisted of approximately 40,488 acres of state land, and 5,831 acres of private land. By the end of 2018, 30,187 acres of land were still held by the military in the two provinces. This comprised 25,946 acres of state land and 4,241 acres of private land. Military occupation of privately-owned land continues to prevent resettlement of internally displaced persons (IDPs). As at March 31, 2018, the government reported that 2,216 persons (from 627 families) in IDP camps remained to be resettled. There is currently no publicly available statistics on resettlement of IDPs since March 2018. Moreover, there is no information on the number of IDPs living outside welfare camps. In some areas, military occupied land has been used for agricultural and commercial activities. For instance, the Army was reportedly using over 1,000 acres of state land in the Northern Province for agricultural purposes. The security forces also continue to be actively engaged in commercial tourism ventures in the North and East, such as the Thalsevana Army Resort, Jaffna and the Marble Beach Air Force Resort in Trincomalee. Meanwhile, there are reports that the military engages in harassment and intimidation of civilians and civil society actors (including IDPs demanding land return, and families of the disappeared) in areas in the North and East. The government has taken steps to support livelihood development in the North and East. For instance, the government’s ‘Enterprise Sri Lanka’ loan scheme and ‘Gamperaliya’, a rural infrastructure programme, include activities in the two provinces. In 2017, the Northern and Eastern provinces reported the highest levels of unemployment in the country, at 7.7% and 6% respectively. Along with demilitarisation, the government pledged to introduce reforms to the security sector in Resolution 30/1. There is no publicly available information to confirm that the government has introduced comprehensive security sector reforms. An agreement was signed between the United Nations and the government that Sri Lankan military personnel deployed to international peacekeeping operations would be vetted by the Human Rights Commission of Sri Lanka (HRCSL). However, in April 2018, the Army deployed 49 soldiers to Lebanon prior to the HRCSL completing its vetting process, in contravention of the agreement. Since 2016, there has been almost no change in the status of commitments under the theme of security and demilitarisation. While there has been some progress in the release of military held land, IDPs continue to remain displaced in some areas as a result of military’s occupation of private land. There has been no comprehensive security sector reform undertaken thus far. Military involvement in civilian activity continues to obstruct the restoration of livelihoods and normalcy in the North and East. This article will be followed by an update on the remaining category under Resolution 30/1.